The Agra Jail Carpet retain the same ancestry and heritage that's found in any Oriental and Persian carpet. Their array of designs, influences & colour gives them their own realm by carpet lovers. Agra rug is a fine and unique example of originality. The Indian city of Agra is home of the Taj Mahal & enjoys an extensive and notable tradition of carpet weaving. Agra was a major production centre for the best of the classical Mughal Carpets. The Mughal emperors not only introduced Persian art and culture in India but also had tremendous liking toward Persian carpets. The second Mughal Emperor Humayun had spent time in exile in Persia and had grown to admire the Persian arts, something the later Emperors remained connected to. Akbar founded the first school of carpet weaving in Agra as he declared Agra the capital of India in the year 1565. Emperor Akbar, despite being an illiterate himself not only patronised the arts, crafts and culture but also ensured that master carpet weavers from Persia are available to train at the school of carpet weaving, thus it was during his rule that the arts, crafts & performing arts flourished in India. Because of a lot of ruckus in the jails he decided to reform the system. He brought some of the finest carpet weavers from the most well-known carpet workshops of Persia to teach the prisoners the art of weaving carpets. These jail birds took a lot of pride in their work and they eventually outshone their masters. The carpets at these jail workshops were made for the royal palaces in India and a few were also sent abroad by the royals as gifts. Since there was no shortage of money, labour or of time constraint, it could take hundred weavers up to 15 years to make a single carpet. Some of the most exquisite carpets in India are from Mughal times which were inspired by the traditional designs of Kirman, Kashan, Esfahan, and Herat. The Mughals not only emphasised on the Persian technique of carpet weaving, but were also deeply affectionate of the traditional designs, patterns & motifs from Persia. The art of carpet weaving flourished and grew in Agra and then changes were incorporated as per the royal tastes & likings. The weavers in India learned to incorporate the magic of colours using their weaving skills and thus more aesthetic approach started to appear in Indian carpets. The result was a modified style that churned out masterworks of creative endeavour which became the fore-bearers of antique Agra carpets. 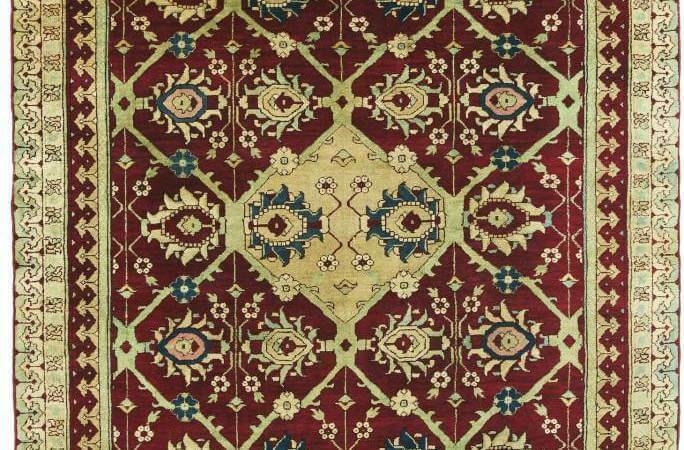 Today, Agra carpets represent the unique blend of the grandeur and grace of the well-known Persian antique carpet designs incorporating their original themes. One encounters the designs of spiralling vines, often combined with small organisms such as birds, elephants, and even people, while looking at Agra Carpets. The designs like rows of flowers in vases can be seen in a popular Agra Carpet. 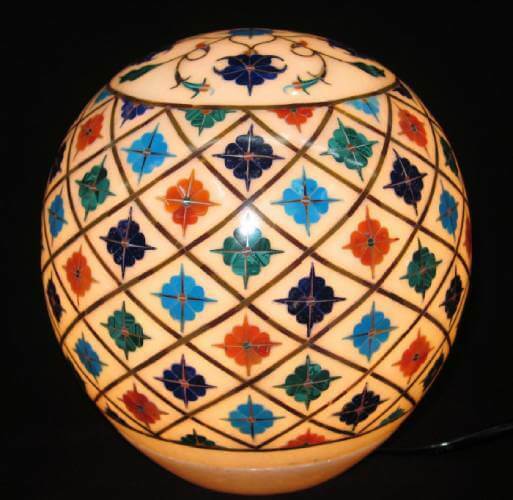 These designs were also successfully embraced by the Persians and in turn the whole artistic "cross pollination" between Agra and Persia continued until the end of the 19th century. Weavers of Agra were masters at vegetable dyeing and eventually created their own unique palette of colour. The weavers furthermore used a range of soft rust-reds, pinks, and a quite appealing lavender tone. These combinations of colour give many Agra rugs a light, ethereal appearance which is beautiful and stunning in any home. Even though the weaving industry in Agra area was limited, its workshops produced elegant antique carpets that have been praised for their thorough originality and workmanship. The antique carpets from Agra, are greatly sought after and have earned their rank over the years, among some of the finest decorative Indian carpets. Agra rugs made in the early 20th century were usually known for superb quality of their ancestral counterparts. Agra rugs are not only uniquely distinct but also are highly acclaimed works of art wherein delicate collage of colour and intricate drawings are quite unique among decorative antique carpets. The artistic tradition of inlay of gemstones on marble dates back to 16th Century when it first made its appearance in Rome as "Pietra Dura". The Medici Grand Duke Ferdinando I of Tuscany founded the Galleria di'Lavori in 1588, today known as the Opificio delle Pietra Dura, for the purpose of developing art forms of his time. This concept of cutting, shaping, polishing and setting gem stones and precious materials in marble travelled all the way to India in the 17th century, during the reign of Mughals. However, it touched zenith only under Emperor Shah Jehan, who was an ardent patron of art and architecture especially in white marble. This art came to be known in India as "Pachhikari" which literally meant inlay work. The most beautiful illustration of this unique artwork is the Taj Mahal, which is decorated with filigree work, stone relief work and above all "Pachhikari" on the cenotaph, walls and on the borders of Jali or filigreed enclosure. This art had reached near extinction during the colonial times as the due patronage from the royal families had finished. The process of inlaying that ultimately culminates in the designing & creating of a masterpiece of marble inlay was mastered by the Mughal artists in the 17th century, which had largely remained unchanged retaining its originality for last 400 years. The master artisans still make use of traditional tools & orthodox technique from the Mughal era using their exemplary skills in achieving the precision in workmanship which they otherwise cannot replicate by making use of most modern-day machines. The art is traditionally living in the families of artists which is then passed on the lines of father to son in generations to come. The master artist selects the design to be inlayed and divides the marble panel in symmetric sections using traditional geometric tools by making a final sketch of the selected design. The entire drawing is traced on a brass sheet, which is cut accurately by a specialist, to make templates of every component of the design, which leads selection of gems and semiprecious stones for the motifs. The gem stones are used to create an effect which is equivalent to "Painting with Hard Stones". The entire plan inlay is carried out by a group of highly skilled artists, each one responsible for completing only one specialized task of the complete canvass. This begins with the lapidary artists, who cut, polish & engrave the selected gem stones on a hand driven grinder. In fact, small pieces of precious & semiprecious stones are held between the fingers, and are shaped on an emery wheel, while controlling its rotations by hand with great care using a cane stick attached with a leather band. The masters have perfected the art of using the mechanism of emery wheels while shaping the stones in a required shape by just by touching the stones on the wheel. This stage of creating the entire design in stones can last from a few weeks to months & years, depending upon the delicacy & intricacy of the design & motifs. Once completed, the work is handed over to the next set of artisans who then set these gems in marble. This phase begins by organising the shaped gem stones on the marble plank, at the given position marked by the master artisans. The contours of these stones are traced with a fine pointed chisel, to draw an outline of each motif on the marble. The shaped gem stone pieces are then removed and kept aside in a chronological order. The artist use hand held chisels, to engrave the marble with great care, to make grooves which correspond exactly with the gemstones. Using specially prepared glue, the gem stones are inlaid in specific grooves created for every individual pattern. Finally, the finished artwork is made ready after it is polished. At last the whole project is carefully examined by the trained eyes and hands of the master before delivery to the art gallery. The unique art of beautiful embroidery in metal threads is called Zardozi, which was used to embellish tiaras, dresses of the royalties in India. It was also used to adorn walls of the royal tents, scabbards and in Palaces as wall hangings including the paraphernalia of regal elephants and horses. 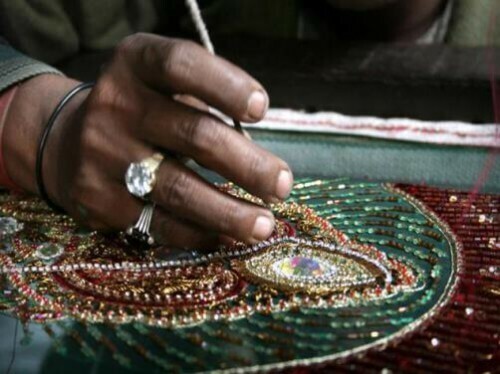 Zardozi involves making elaborate designs, using gold and silver threads and embedding pearls and precious stones in process of enhancing the magnificence of the work. Akbar the Great patronised Zardozi, but under the rule of Aurangzeb, the royal patronage stopped and this led to the decline of the craft. Since the cost was too high and raw materials quite rare, craftsmen could not carry on with the embroidery being on their own. However, Present masters of embroidery introduced craft of embroidering using a combination of copper wire, with either gold or silver polish, and a silk thread while using precious & semi-precious stones sewn simultaneously in their piece of art keeping the art of Zardozi alive. One of the most famous masters of Zardozi was Sheikh Shamsuddin from Agra. His embroidered work of art are the finest artful embroidery pieces in the world. His three-dimensional handcrafted embroidery artworks are decades old & are available on display in a private museum. In the realm of commercials his specialty in embroidering shows his virtuosity in natural sceneries, natural motifs like peacock, birds, flowers and many such elements. In 1980 the Government of India honored him with the State Award for his promising contributions in the art of embroidery. He participated in exhibitions in India and abroad and has made India proud with his excellent works of embroidery. Sheikh Shamimuddin's third son has inherited his father's artistic legacy and is carrying it forward efficiently by running embroidery studio successfully, wherein he is also training young aspirants to learn the craft. It is a breathtaking experience to witness this unique art of embroidery while you are touring Agra. Just let your Guide know of your interest and an appointment can be worked out as per the convenience to enjoy the art studio.